Maybe all of this Social Media stuff will not add up in the end. Maybe all of this Social Media stuff will just be a fad. As much as I like to discuss, debate, dissect and hack Social Media, New Media and everything else related to Digital Marketing, the truth is that I don’t know how this will all pan out (in fact, nobody does). I’m hedging some big bets that Social Media is the future of media. I’m confident that the way in which we all get the news will not suddenly go backwards, and tomorrow we’ll have it rolled up nicely into a newspaper on our front porch, or we’ll get it at 11 pm on our televisions. The proverbial toothpaste it out of the toothpaste tube and it’s not going back in. Whether or not Social Media becomes something that looks like the traditional mass media in terms of penetration, importance and advertising revenue is not as relevant as the new reality that the world has changed. The media has been disintermediated. The media has been fragmented. The media is very different from what it was five years ago. It’s time to stop the uncertainty. Last week, I gave a keynote presentation at an event called, The Art of Marketing. I had the pleasure of sharing the stage with Seth Godin, Avinash Kaushik, Jeffrey Gitomer, Max Lenderman and Andy Nulman. The day was filled with learning, laughs and insights. As much as I think I know, I usually spend days like this turning provocations, key takeaways and ideas into actions (they could be things for clients, Blog posts, the growth of Twist Image, or whatever). Days like this are my continuing education. In this instance, it was something Seth Godin said that struck the deepest chord. "This is a Marketing Revolution." It’s easy to fill the air with platitudes. It’s easy to tell an audience that Marketing has changed. 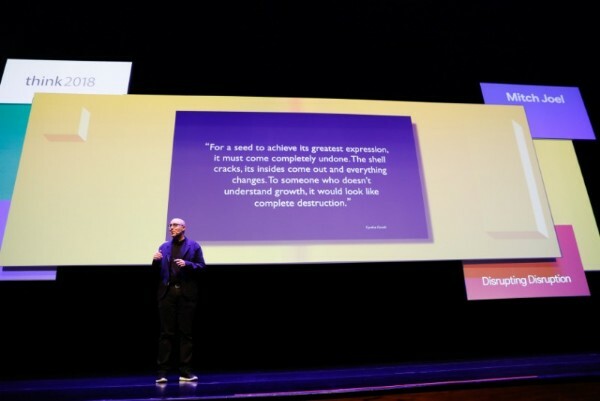 It’s not easy – and it can’t be taken lightly – when someone of Seth Godin’s stature and respect in the industry says that what we’re going through isn’t a change or shift, but a full-on revolution. I used to have a slide with the number 300 on it. I used to tell audiences that much like the fictionalized retelling of the Battle of Thermopylae in this best-selling graphic novel and Hollywood hit, this is our Marketing 300. It’s that unique moment in time where the outcome of the moment will dictate the future generations. I backed off of this story many years back. I was worried people would think I was being too dramatic. I was worried that people would think, "does this Mitch Joel dude really think that a Blog is going to change Marketing forever?" Ultimately, I was afraid that I might be wrong. We’re not wrong. Seth Godin is not wrong. This is a revolution. It’s what Seth said next that really drove the battlecry home. He said: "don’t waste it." And, that’s the important part. Too many Marketers – from Chief Marketing Officers to heads of agencies – are either grasping on to the world as it was, adding in Digital as if it is just another new channel, or burying their heads (and marketing budgets) in the sand. Fine, mass media still has tentacles and teeth. Nobody is denying that, but it’s not a zero-sum game. Social Media is not a fad. Social Media is a fact. If brands and agencies are not mastering these channels – figuring out these real relationships, these real voices and these real human beings, they are not only missing the boat, they’re ignoring the tsunami. I’m changing my presentation back to the way it was. I’m putting the backbone back in. I’m willing to eat crow if I’m wrong, but I don’t think that I am. Seth is right: this is a Marketing Revolution. Seth is right: we better not waste it. I’d push this even further and urge everyone to not screw it up! No one’s prepared for glory. Glory is past-tense – we never experience our own. We can experience the glory of others – the fallen, the passed – but not our own. Glory implies a war of attrition, rather than a critical cultural shift. Revolution may be a perfectly apt term – but it also carries an unfortunate air of impermanence. I don’t think we’re going for temporary, here. Mitch, I think REVOLUTION is a great word for this. Renaissance is another and when you think of what the long lasting effects from that, wow. You know much more on all this than I do but I think it’s worth betting the farm on this revolution. I think the revolutions consist in regular people taking power and doing something with it, and thats exactly what´s happening. Today anybody with an internet connetion can influence millions (billions) to change a point of view, change marketing, change politics, and businesses. I´m desingning a web site to give small businesses the oportunity to use direct marketing through social media, and thanks to this revolution I´m abble to do it. Any recommendations to my idea? Do it well. Master it. Share and be open. You’ll know – in short order – if it’s working. If we look back on the history of written word — prior to the advent of mass circulated printed matter, in the coffee shops in the City of London bankers and brokers would read handwritten manuscripts or articles summing up the news of the day, or pertinent gossip. The bankers and brokers were weary of printed material as they felt that the mass produced news of the day could not be trusted as there didn’t appear to be any human investment in its production. The same can be said of the digital landscape today — with an entire generation relying on alternative news sources, blogs, and personal recommendations from close friends or family via social media platforms. This same generation is allergic to being interrupted whilst they are dong what they do — and avoid pre-rolls, interruption marketing, and every other means of being sold to. This generation cannot be sold to – they have to be bought with trust. This is awesome. And true. We’re in the midst of a revolution, yet most are still waiting for someone show them what to do or copying what their dummy friend is doing. Once you realize there are no norms, and no formulas or rules to follow, it’s kind of freeing, and gives you the jolt you need to go out and kill it in your own uninhibited way. No one exemplifies Persia’s freedom better than Herodotus himself. He describes Athens as the bastion of freedom, yet he chose to live in Persia. Xenophon, on the other hand, who actually lived in Athens, reminisces enviously about the monarchy of Cyrus The Great. Why did Herodotus not live in Greece? Because Persia – the empire he is so quick to demonize – afforded him the very freedom to publish his scathing report of it. People want to live where their god-given rights are protected, regardless of whether its democratic or monarchic. What I see happening is not so much a marketing revolution as a business revolution. The way business is done has to change because the way information is exchanged has changed. What that has done is allowed consumers to exchange information in a new way, and it has forced companies (willingly or unwillingly) to respond to customers in a new way. Perhaps over-used but I think that the customer-centric nature of business and the mass of niches (Jeff Jarvis term) is the real revolution and the real opportunity. I don’t who “you guys” are, to be honest. This is not something that Marketer thrust on the world. It’s a change that has affected Marketers (well, actually, everyone else in business too). I think the term revolution does apply. I also think that we’re not talking about in a violent way where others die or are suppressed. This is a Media Revolution, and I take no issue seeing it that way. With that, we live in the most branded generation ever. People hear “Marketing Revolution” but what they’re really hearing is “Advertising Revolution.” Let’s not confuse the two and let’s not assume that this Marketing Revolution kills everything else. It may very well not. Advertising and Marketing will always be around, this revolution (from my perspective) will just pave the way for the “why” (the strategy) and the “how” (the tactics). The landscape will look different but it will always have remnants of what brought it forward. …for those who are brave. For those with established business models, long-held clients, major payrolls and mouths to feed this is terrifying (understandably so). In any kind of revolution the few brave souls are just that… the few. I completely agree that social media is here to stay but I still think it has a lot to learn as a professional working environment combined with the social networking we have all come to know and love. No one said a revolution was something easy. I have been convinced of this since a while, and the reason in my opinion is that for the first time the individual is in the center of this media revolution. Not stories or news or information about people, but people creating stories, news and information and growing the network on their own, connecting, sharing, relating. It reminds me of Skynet in Terminator: as soon as it became self-aware, it copied itself in every computer system in the world. Old media was a centralized hub, people were clients sucking information from it. Now every person is a media hub, everyone can matter, and noone should be ignored. …and imagine a world where those hubs are actual networks and each network speaks to one another independently. Right now each hub still goes back into the Internet. Imagine a world where our iPhones can speak to one another… not through one network by network to network. Each device becomes its own Internet! Thanks for coming to the event and the review! One of the foundations of social media is transparency, honesty and ultimately, trust. The main stream media can no longer be influenced by advertisers’ agendas. I feel that fulfilling the definition of a revolution partly lies in the shift of power in media to the “honest reporters.” Jon Stewart and the Daily Show is an example. A large step to be achieved in the current revolution will be the shift towards those common goals. Now the question is, how do we get people on board with that notion? It is a revolution. Social media is changing, has changed the way business is done and will be done. I meant leading speakers and great thinkers in the emerging marketing change who we all follow. I agree it has affected everything and I understand that we’re not talking about violent and bloodshed as in picking up arms and killing people, however we could also argue feeling or being violated on lesser degrees is of the same essence, i’m going to use our wild imaginations here and refer to someone who loses his job in traditional media let’s say a local newspaper and feels violated by the revolution of social media and not invited by the evolution of it. 1.an overthrow or repudiation and the thorough replacement of an established government or political system by the people governed. Ray H.: Really enjoyed the “call to arms” and to feel your passion. I don’t see it as gradual anymore. The gradual part happened. Marketing wasn’t paying attention and now it’s a revolution. I appreciate your side. I hope you can appreciate mine. How do we get them on board or does the change just happen. Sometimes, the change just happens. I would add that many of the tried and tested marketing ideas apply, yet the playing field for distributing messages and connecting to customers has changed and will continue to change, DRASTICALLY. If we were not on the ship, moving with the tide, testing, experimenting, we would be even more astonished ourselves. Some not even on the ship or moving along at a snails pace may never recover. All in all, looking forward to it, embracing it, drinking it, challenged by it, exciting times. I have listened and read to tons (well actually I have never weighed them) of your blogs, podcast etc and you have always been a consistent advocated for real people having real dialogues as a cornerstone for social media. But I think that part of the revolution will be how business will manipulate and alter social media as we now use it. As social media becomes a bigger marketing force so will the forces of business and their marketing agents to alter that real people and real dialogue and that might steal the power of the revolution and real people will go else where. Just a thought. It reminds me of when religious groups get involved in politics thinking they will bring morality to the political process and they get seduced by the power and lose their moral compass. maybe I need to understand your side first. Correct me if I’m wrong Mitch but are you saying Social Media came to existence through evolution(gradual) and now Marketing has taken over and spearheading things by Revolution rather than Evolution which is the essence of Social Media? I don’t believe evolution is bound and can only be gradual. Maybe an example would help me appreciate your view better. I think the platform of Social Media had something to do with this, but Marketing – in general – is going through a revolution. It’s happening faster because Marketers were not paying attention to many aspects that affect our world (changing consumer habits, new media platforms and many other components). Social Media is a large component but it’s bleeding into other areas for Marketers as well (think about technology and changing consumer habits, etc…). The fear is that we aren’t even equipped should we embrace it all. How many Marketing organizations do you know that have the technological infrastructure and the human capital resources to even make the current data sets work for them? You can probably count them on one hand. Pushing that further, do you think that brands are even ready for this data and what it means to Marketing? It happens all of the time. I would argue that it’s currently happening. Look at how AOL bought TechCrunch and some of those other mass media acquisition plays – it’s the nature of the beast. That being said, there is always an appetite for the more independent channels… but it’s never as big and mighty as the stuff that attracts the masses. Forgive me, Mitch, for not “adding value” with this comment as people like me often beg of others. I simply wanted to say I found your post inspiring. Thanks for writing it.